We do not curently have theatre tickets available for Alice's Adventures Underground. This could be because we have simply sold out or it could be that this show is no longer running. The information on this page remains purely for historical and informational purposes. ”There is a place. Like no place on Earth. A land full of Wonder, Mystery and Danger” wrote Lewis Carroll. 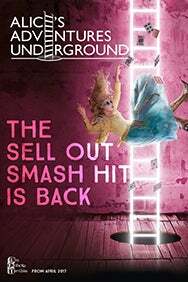 Returning after a sell-out run in 2015, critically acclaimed theatre company Les Enfant Terribles, in collaboration with ebp, bring their Olivier award nominated Alice’s Adventures Underground back in 2017! Tumble down the rabbit hole falling fast into Wonderland, wandering through this ‘topsy-turvy world, wide-eyed’ (The Times) with ‘visual and tactile treats embedded everywhere!’ (The Evening Standard). Make a series of choices; Eat or drink? Grow or shrink? Take tea at the biggest un-birthday party with the maddest of Hatters; let the Cheshire Cat take you hither or thither or join the underground movement to rise against the fearsome Queen of Hearts. Revel in the ‘Wonderland of your imagination recreated before your eyes’ (The Guardian) finding yourself at the centre of the story piecing together the puzzle searching for Alice who has been lost in looking glass. If you are already a Wonderlander, be prepared for new surprises and if you’re yet to be greeted by the White Rabbit, come and experience ‘real magic and wonder’ (The Stage). Don’t be late! Logic will fail you. Nonsense will overwhelm you!